For some reason (perhaps the fact that it’s one of the biggest tourist attractions in the world?!) I thought it would be easy to figure out how to visit the Statue of Liberty in New York. But somehow the internet failed me. As did my guidebooks. So, I ended up stitching together the requisite details – how to book, where to get my tickets, the ferry route, timing and all the rest of it – from myriad websites and forums. Before I get started, it’s worth noting that there is a free option for seeing the Statue of Liberty by taking the Staten Island Ferry and I’ve got more details on how to do that below. 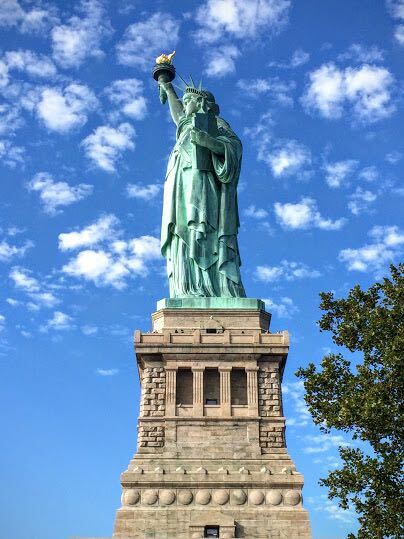 However, having taken both the free ferry option and visited Liberty Island (the place the lady in green calls home), I’d highly recommend the paid-for option. Here’s a photo of the best view I got of the Statue of Liberty from the free Staten Island Ferry. This was taken a bunch of years ago on a standard point and shoot digital camera. Compare that to this picture which I took from Liberty Island with my iPhone 5. Exactly. A lot of travel bloggers will tell you that they never take tours, as though its somehow beneath them to travel in such a ‘touristy’ way. I’ve been on lots of tours and they very often given a more enhanced experience. However, that’s not always the case and if you’re able to go it alone (and save some dollars in the process), why not. In the case of visiting the Statue of Liberty, I’d say you don’t need to take a tour. With my instructions below on how to get tickets and get around the islands, the planning element is covered and when you get to Liberty Island there is a superb free Ranger tour (more on that below) you can join that gives even the nerdiest of visitors (puts hand up) the facts and figures they need. And when it comes to visiting Ellis Island, I was frankly pleased I could proceed at my own pace. That said, if you’re looking to take a paid tour, here are a few tours to check out – they have a similar itinerary and price so it comes down to which company you prefer. If you’re looking to see the Statue of Liberty from a different angle, there are plenty of helicopter tours on offer. Click here to check prices with Expedia. 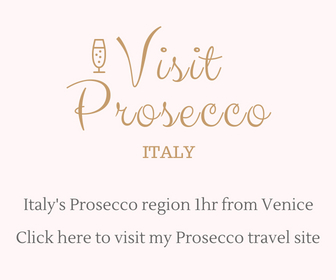 Or, Click here to check reviews and search tours recommended on TripAdvisor. Did you know? The Statue of Liberty was officially called Liberty Enlightening the World and was a joint endeavour by France and the USA to celebrate the 100th anniversary of the Declaration of Independence. Lady Liberty was a bit late (10 years) but was finally dedicated on October 28 1886. 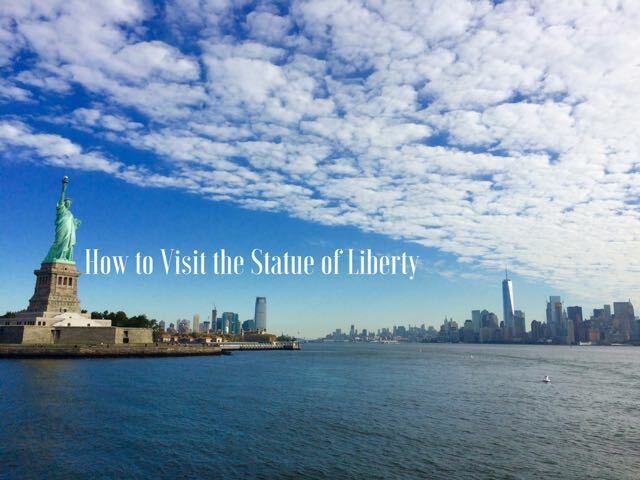 Now, let’s get down to the details of how to visit the Statue of Liberty in New York – there’s quite a lot of information in here but as you’ll come to realise, getting to see Lady Liberty isn’t quite as simple as turn up, buy ticket, take photo. Stick with me. I’ll try to make it as painless as possible. Liberty Island and Ellis Island are part of the National Park Service and are therefore free to enter BUT (don’t you hate it when there’s a ‘but’ after ‘free’?) you still need to get there by ferry, which is basically what the ticket price covers. There is only one official ferry company that’s allowed to ‘land’ you on the islands – Statue Cruises. The official Statue Cruises website is here. I’d highly recommend book directly with statue cruises. If you don’t, you’ll end up paying more dollars for..well, no reason other than the ticket company’s profits. As an example, the above company charges $25 (Reserve and Pedestal) and $28 (Crown) for what should be $18 and $21 tickets. You don’t even get a free bumper sticker thrown in. Stick with the official provider: Statue Cruises. Can I buy official tickets offline? 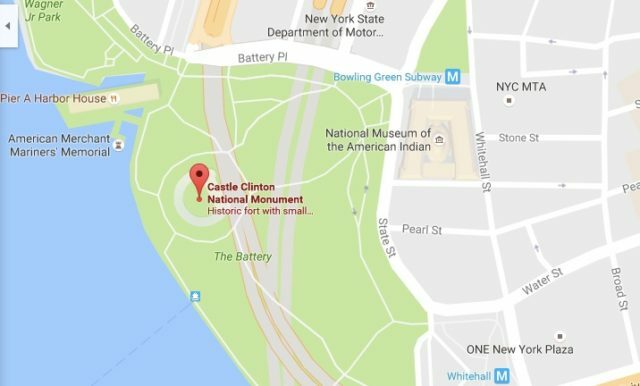 At Castle Clinton (the Manhattan departure point) in Battery Park (open 7:45 AM to 5 PM). What type of ticket can I buy? Reserve Ticket $18 – This ticket includes the ferry rides to Liberty Island and Ellis Island as well as access to the immigration museum on Ellis Island. You can walk around the grounds of the Statue of Liberty and get excellent photo opportunities but you cannot go inside the statue. Reserve Ticket with Pedestal Access $18 – this ticket is the same as above except you are able to go inside the Statue of Liberty up to the top of the pedestal. You’ll notice the cost is the same as a reserve ticket so if this ticket option is available, go for it over the reserve ticket. Reserve Ticket with Crown Access $21 – there’s some pun in here about this being the crowning glory of the ticket options…but we’ll gloss over that. However, this is the most highly coveted ticket you can get because you get to ascend the Statue of Liberty all the way into the crown. However, you must, must, must have a stomach for heights, winding stairs and tight spaces. Also, see my thoughts below on whether Crown Access is all that great. You’re required to book a time-slot of 9 am, 10 am, 11 am, 12 pm and 1 pm (more on that below). All three tickets offer ‘priority’ boarding/access at the security clearance – it’s not clear, but I presume that this is priority compared to people who have a city sightseeing pass and didn’t book their tickets direct. With all tickets you get a free audio tour and/or Ranger tour. You can only buy 4 tickets per transaction so be prepared to ‘checkout’ more than once if your party is larger. You can only buy tickets once every 6 months (I guess this is aimed at touts). Tickets have your name on them so you can’t transfer them/sell them if you can’t go. Concession prices are available for students, elderly and children. Kids under 4 go free. Anyone 17 or under must be accompanied by an adult. Do I need to book the ferries separately? The tickets above include the cost of your ferry to Liberty Island, Ellis Island and back to your departure point so you don’t need to book ferries separately. Which time-slot should I book? Assuming you have the full choice of time-slots for the day you’re looking at, I’d recommend the 9 a.m. slot (and this from the girl who isn’t a morning person). Why? being on one of the first ferries to arrive on Liberty Island, you’ll be able to explore in relative peace and quiet. As the day goes on and people linger, the crowds grow. you’ll also then be on one of the first ferries to Ellis Island, again avoiding the masses. it gives you the best chance of seeing what you want to see without rushing. After visiting both islands, I was back in Manhattan by mid-afternoon. Any later ticket and I’d have been pressed for time. 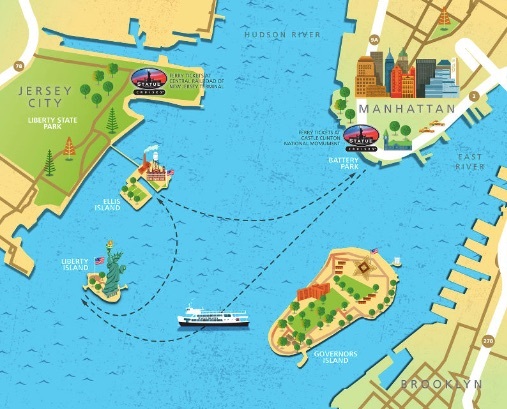 even according to the official Statue Cruises website, booking the 1 p.m. slot will not give you enough time to visit both Liberty Island and Ellis Island. What does my time-slot actually mean? View from the ferry looking back over Battery Park – that’s the beautiful new World Trade Centre (with the antenna) if you haven’t seen it before. This bit really discombobulated me. I had booked a ticket for the 9:00am but it wasn’t in the slightest bit clear what that actually meant. Was it the time I needed to collect my ticket? Was it the time I needed to ‘check-in’ i.e. show my ticket and go through security? Was it my ferry time? Was it the time I needed to be on Liberty Island for my Crown Access slot? Checking the ferry schedule only confused things further as none of the ferry times corresponded with ticketed time-slots. Add the fact that the Statue Cruises website recommends that you turn up 30-minutes in advance of your slot and you can see why I was pulling my hair out. In the end, I turned up at the Departure Point (in Battery Park) at 8:30am, which turned out to be the right guess. I collected my ticket, had it checked, skipped through security (just kidding – like anyone ever skipped through a USA security check) and then boarded the ferry. All in, there was little drama surrounding the timing of the ticket, which I came to realise was more indicative than strict. Still, I wouldn’t over or undershoot your time-slot by too much. Plus, by turning up early, you can get a good spot on the ferry. Top Tip: If you’re after great ‘approach’ shots of the Statue of Liberty, the third level on the right of the ferry from Battery Park to Liberty Island is the best place to be. What’s the difference between pedestal and crown access? 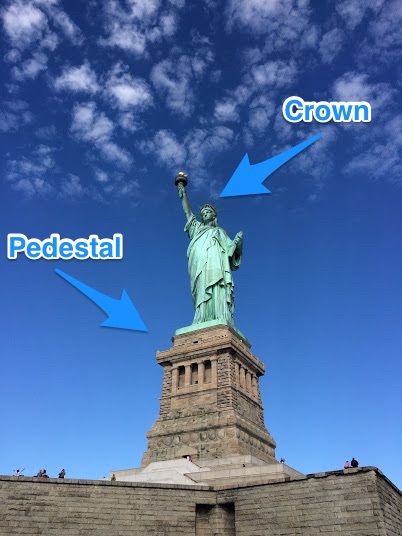 In short, the pedestal is the ‘brown concrete’ part of the Statue of Liberty structure and the crown is…well, the crown…but also the highest accessible point. Did you know? I know it’s not polite to discuss a lady’s measurements but the Statue of Liberty has a 35 ft waistline. Must be all that New York strip-steak. Makes me feel a bit better about my exanded waistline post New York. How accessible are the pedestal and crown? To the top of the pedestal: There is an elevator that will take you to the top of the pedestal which you might want to consider taking given the alternative is climbing 215 steps. That said, if you’re fit and able, the climb gives you access to a few viewing stages compared to the elevator, which spits you out at the top viewing platform. To the crown: From the top of the pedestal to the crown there is NO ELEVATOR. Instead, you have to climb 162 steps, and they’re not the most appealing steps either – you’re in an enclosed spiral staircase the entire way. I’m not trying to put you off – I’m sure you’ll be able to do it but just take a steady pace, hold on tight and don’t let impatient idiots rush you. Oh, and if you’re taking kids up there, they must be at least 4 ft tall (to be honest, at 5ft tall I only just fit the height requirement!) and be able to walk unaided. 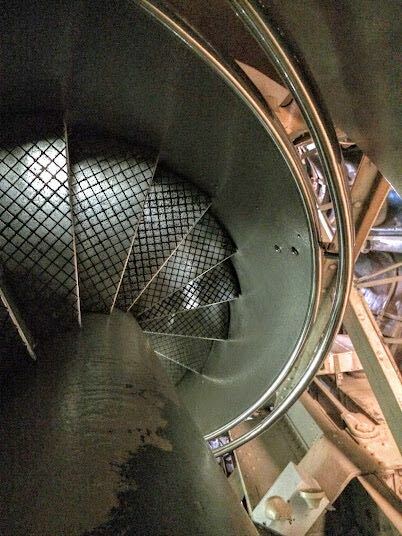 This is a picture of the spiral staircase you need to climb from the pedestal to the crown – I’m looking at it from above (against all popular advice to ‘don’t look down!’. If you’re not feeling in peak fitness, taking the elevator to the top of the pedestal combined with the climb to the crown is a great compromise. If you have accessibility questions, you can find out more here. 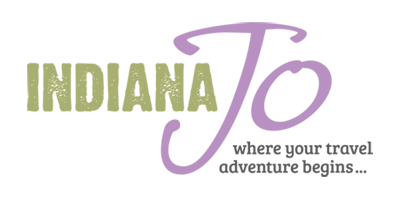 For more general questions about Crown Access, see here. On a budget: HI NYC Hostel. Hostelling International hostels are as reliable as they come. As well as a great location and all the usual facilities, there’s a great list of social activities to get you involved. Perfect if you’re travelling solo. (If you’re looking for an up and coming area, check out the Local NYC, a design hostel in Queens. Want a central location: you can’t get a more central spot that the New York Marriott Marquis. Don’t miss the revolving roof top cocktail bar and restaurant. You’ll find a list of alternative hotels in New York here. How far in advance should I book tickets? Around 4 million people visit the Statue of Liberty each year, which is a pretty good way of saying – book as far in advance as you can. In fact, at the time of writing, Crown tickets were sold out solidly for the following 3 months. So, booking 3 to 4 months in advance is recommended. Pedestal tickets, on the other hand, tend to have more availability and can generally be booked for the following week (but don’t count on that over holidays and popular dates). All that said, don’t let a 3-month ‘sold out’ status deter you. I booked in September and was able to get a Crown Access ticket for just 10 days later. This may have been a fluke and I was booking that rare ticket for one (cue: violins), but it’s still worth checking. Crown Access tickets are not available on the day. You can buy both the Reserve Ticket and Pedestal Access tickets on the day but Pedestal Access tickets are highly likely to be unavailable on the day. If you do try, make sure you buy them at one of the departure points as they’re not available from Liberty Island. What if I have a city sightseeing pass? he eventually used her big flame to burn away those thick clouds. You get a Reserve Ticket only. Unlike direct-purchase tickets, you don’t have a time slot – you just turn up on the day and line up at the ticket window to exchange/show your pass for a ticket. As you don’t get priority access in the queues, I’d definitely recommend turning up early. To get Pedestal Access, you’ll need to see what’s available on the day on a first come, first served basis, which doesn’t present a great chance of success, especially not in peak season. Crown Access isn’t included so you’ll need to buy a ticket like everyone else and you can’t deduct the $18 Reserve Ticket that’s included in your pass from the ticket price. Out of the passes, only CityPass seems to ‘compensate’ you for this – if you choose not to use the Statue of Liberty element of your pass, you can swap it for a 2-hour Circle Line Cruise. Yay CityPass! How to I pick-up my tickets? Reserve Access and Pedestal Access: when you book online, you have a choice of receiving your tickets by email to print at home or picking them up either on the day or in advance from the ticket booth (known as Will Call). There is no price difference for either option so I’d recommend printing the tickets yourself as it’s hard to predict how long you may have to queue to collect them in person. Crown Access Tickets: regardless of how you book, you must collected Crown tickets in person from the Will Call window at your departure point. Note: if you pick up tickets at the Will Call window, you’ll need photo ID and the credit card you booked with. What about the ferries and departure points? You can check out the full departure schedule here. 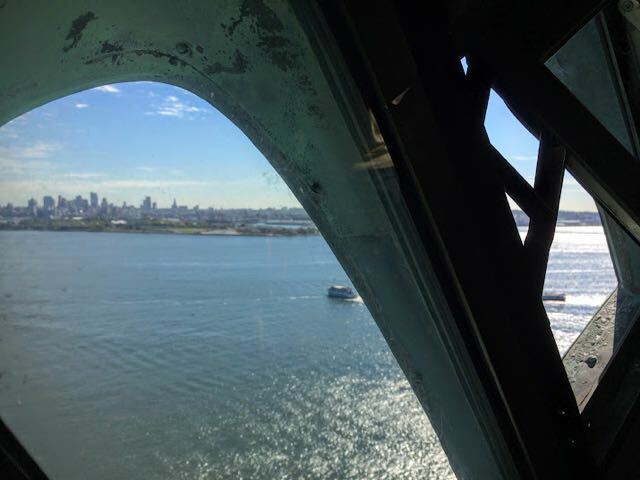 The key thing to check when you re-board the ferry at Ellis Island is which departure point you’re returning too – you don’t want to end up on the wrong side of the water. 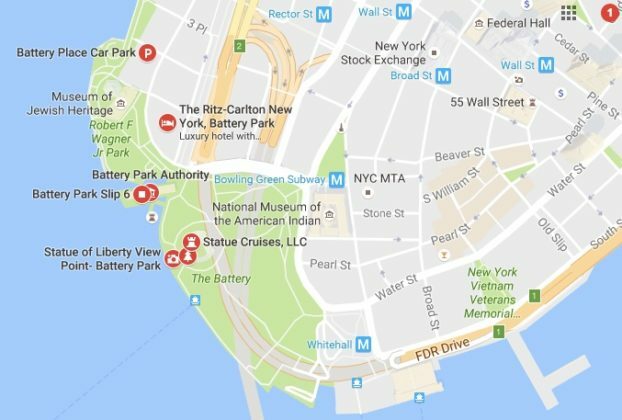 If you’re departing from Battery Park (as most tourists will), head to Statue Cruises LLC as shown on the map above (this is also Clinton Castle on Google Maps, just to confuse you)! It’s a 5-minute walk from Bowling Green Subway or 10 minutes from Whitehall Subway. Broadstreet and Wall Street Subways are also close. You can find my all-time favourite subway map app here for Apple and here for Android. The apps is free, can be used offline and will plan routes for you. 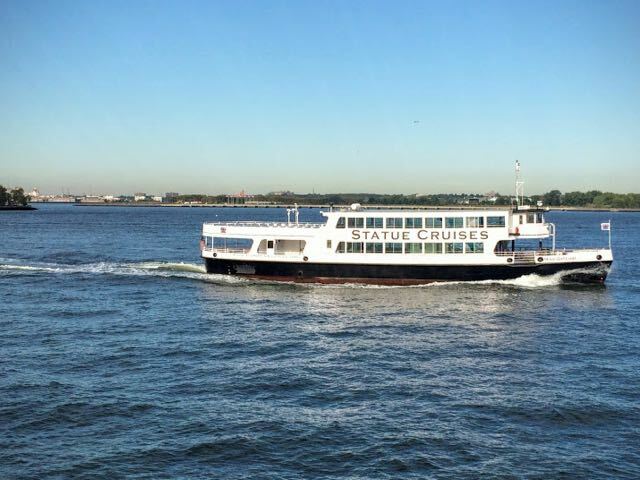 The ferries start at 8:30 a.m. (first ferries leaving Battery Park and Liberty State Park) and run until around 5:45 p.m. (peak season)/ 5:00 p.m. (low season). However, those later timing are for return to your Departure Point. 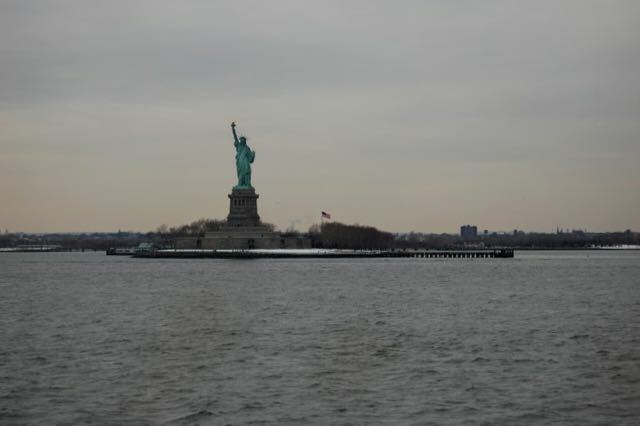 The last ferry out to Liberty Island leaves at 4:00 p.m. (peak season) and 3:30 p.m. (low season). 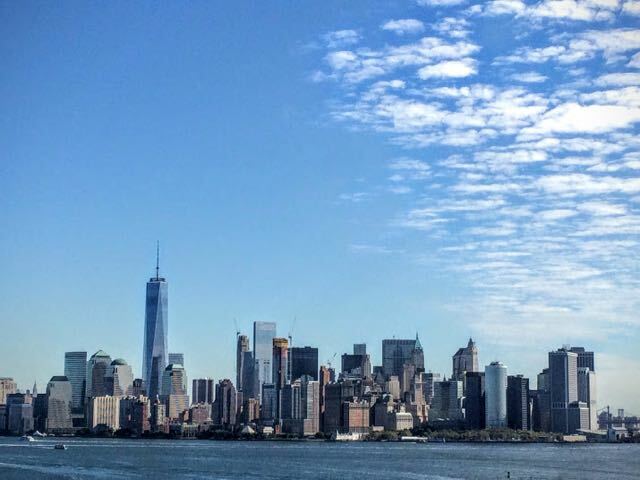 The ferry service is also limited towards the end of the day with the last ferries offering access to Liberty Island (from Battery Park) or a choice of Liberty Island or Ellis Island (New Jersey). Unhelpfully, the ferry schedules differ between the National Parks Service website and the Statue Cruises website. If you expect to be there late in the day, check with the ferry operators or at the information centre on Liberty Island. 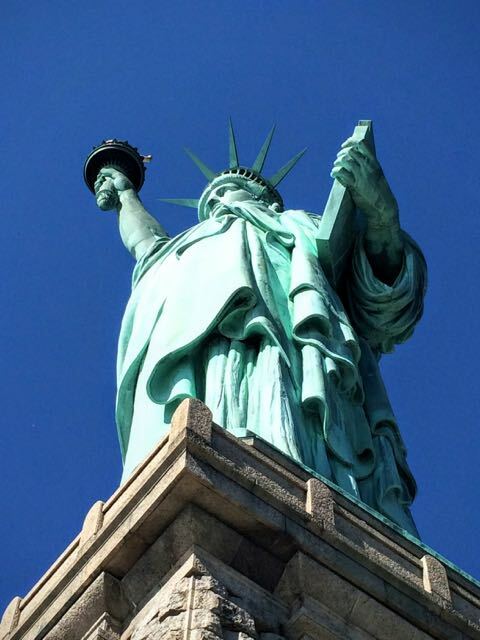 Liberty Island and Ellis Island are open 364 days a year – the exception is Christmas Day. Also taking a trip to Niagara Falls? Consider going from Buffalo for only $5! See how to do it here. Hang on, there are two islands included in the ticket price? 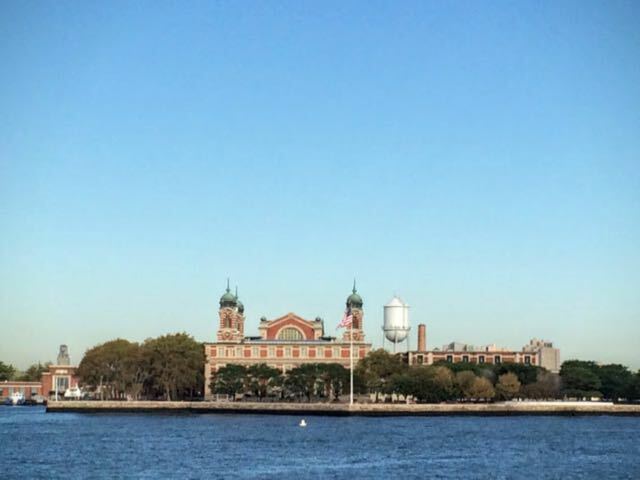 Ellis Island – the Island of Hope and Tears. Visiting Ellis Island is obviously as optional extra and if you don’t want to visit, just head straight back to Battery Park or Liberty State Park after you’re done seeing the Statue of Liberty. That said, I’d highly recommend taking the time to see both. What’s the security situation – do I need to take my shoes off and put my shampoo in small bottles? The Statue Cruises website warns visitors that they’ll need to go through ‘airport grade’ security but don’t worry it’s not nearly as rigorous as what you’ll go through at the airport. At the ferry: You do need to go through a scanner to get onto the ferry at your initial departure point but it seems like they’re scanning for weapons rather than liquids and iPads. The list of prohibited items is: weapons, scissors, sharp implements or tools, luggage, packages and parcels and face masks or costumes that can conceal your identity (with great regret I put my Batwoman costume back in my suitcase for another day). To enter the statue of liberty: if you have Pedestal or Crown Tickets you need to go through an additional security check which largely involved checking for ID (for Crown Access) and making sure you put your possessions in a locker before ascending into the statue (both Crown Access and Pedestal Access tickets). Photo identification: For Crown tickets you’ll need to bring photo identification. I used my driving license and passports would be acceptable, too. Beyond that, I can’t find official information about what ID will or won’t be accepted though the main thing that was checked on the day was whether the name on my ID matched my ticket. ID is required for every person with a ticket not just the person who booked. However, ‘minors without ID’ apparently don’t need to show ID but again there is no clarity on what ‘minor’ – I’d guess under 18s? Lockers: beware that once again the Statue Cruises website and the National Park Service website give inconsistent details on what you will or won’t be allowed to take inside the statue for Pedestal Access and Crown tickets. The Statue Cruises website says you have to put backpacks, strollers and large umbrellas in lockers. In practice (and according to the NPS website), you can’t take anything inside the statue apart from one camera, drinking water and necessary medication. Fortunately, there are plenty of lockers right there at the entry to the Statue, large and small, costing $2 for 2 hours. Although my guidebooks failed me when I was trying to figure out how to visit the Statue of Liberty, I love the compact size and condensed information in the Lonely Planet Pocket New York City Guide. If you’re looking for a more detailed guide, Lonely Planet has one. This 36 Hours in New York guide by the New York Times is on my list for next time. What are the highlights of a visit to the Statue of Liberty? Mr Ranger. Did a top job. And looks like every stereotype I have in my head for what a Ranger should look like, so extra points for that. The ranger tour of Liberty Island was by far one of the biggest highlights of my visit, which surprised me. Wth just enough facts and figures and history to get you started, I’d opt for this human tour over listening to the audio guide (though both are included for free). Tours leave on the hour from the information office and take only 30 minutes. You can find out more about the ranger tours here. 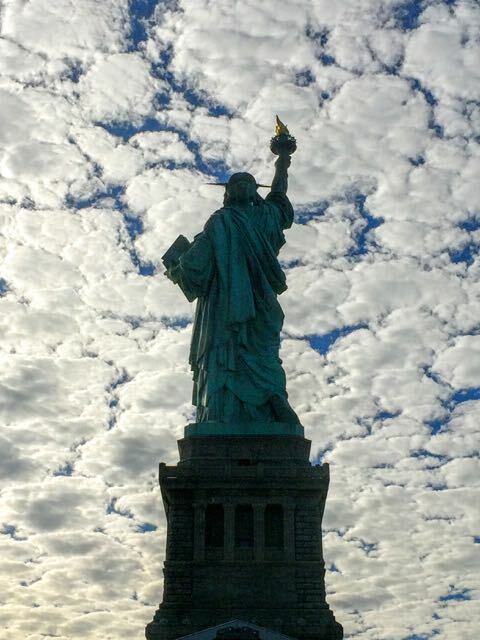 Standing underneath the Statue of Liberty and looking up – you’re not going to get that view anywhere else. 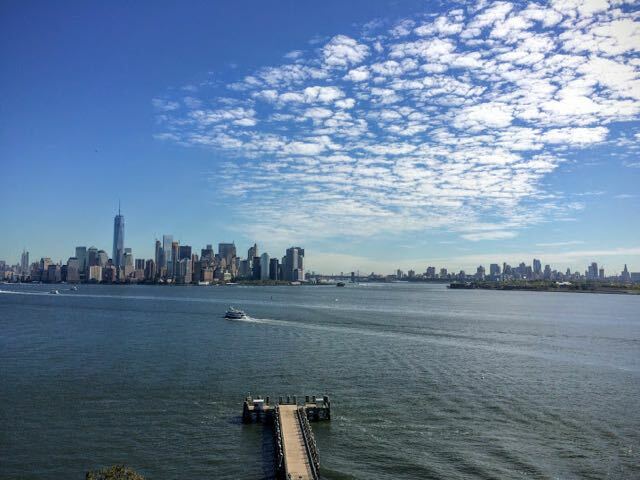 Views across New York Harbor towards Manhattan – even from the ground, the views across New York Harbor, taking in Manhattan are unlike any you’ll get elsewhere. The immigration museum on Ellis Island – for years and several trips to New York I didn’t bother visiting the Statue of Liberty because I though my time would be poorly used seeing Ellis Island. Oh, how wrong I was. Even if you’re not fascinated by immigration (as most people aren’t), this is genuinely one fascinating island. Tell yourself you’ll give it just an hour. I bet you end up giving it more. Also great for understanding a lot of US history. Is Crown Access really that amazing? Honestly? I’d say not really. Apart from the climb being exceptionally vertiginous, when you get to the top, the ‘peep holes’ for views over Manhattan were i) a lot smaller than I expected; ii) made out of perspex and therefore too scratchy for great visuals (or photos); iii) in hot demand, so there’s a lot of pressure to have a look and kindly move on; iv) experienced whilst scrunched into hot, tight spot with a bunch of strangers. 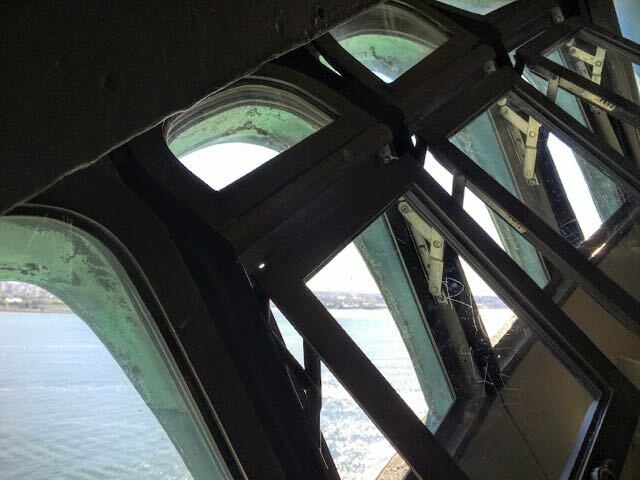 These are the tiny ‘peep holes’ you get to look out of inside the crown of the Statue of Liberty – don’t they look like they’d be bigger when you see pictures of them? Also, check out the etching on the perspex. Photo ruining vandals are the worst. This is one of the views you get from inside the crown – not as impressive as I thought it would be and makes for ‘meh’ photos. Now lets compare that Crown Access photo above to this photo that I took from outside on the pedestal. All in, I’d say that pedestal access would have done me and I wouldn’t be majorly disappointed if you can’t bag one of the highly coveted Crown tickets for your trip. Visiting both Liberty Island and Ellis Island, climbing into the crown, a quick coffee and sandwich break to refuel and a relatively quick look around the immigration museum on Ellis Island took me about six hours from arrival at the departure point in Battery Park. From the research I’ve done online, that’s about standard. However, if you visit during peak season, add extra time (to the tune of hours) for security checks and ferry queues, which can add an extra 90 minutes per ferry ride in peak season (April to September). If, on the other hand, you visit in low-season and are ‘efficient’ with your time and don’t climb up to the crown, you could probably cut this down to half a day. In other words, don’t dismiss a visit to the Statue of Liberty just because you’re short on time while you’re in New York. Food is a big part of my travels and sadly the only good thing I have to say about the food situation during my visit to the Statue of Liberty was that there was food (the only thing worse than bad food is no food)…oh, and the serving lady on Ellis Island was lovely and cheerful. On a more objective/factual note, food concessions are available on the ferry and at both islands. As you can imagine, the prices are higher than you’d pay if you were not at a major tourist attraction, but costs aren’t prohibitive. The food on the ferries was largely snack-based – coffee, coke, chips, hotdogs. I only visited the Ellis Island cafe where a bunch of sandwiches, salsads and other lunch food was on offer. It was ok but nothing to write home about. In hindsight, I’d have packed a picnic of a nice deli sandwich from somewhere in Manhattan and I’d recommend you do the same. Oh, and pack plenty of snacks and water because it can be a long day that requires plenty of refuelling. I mentioned at the beginning that there is an option to see (or more accurately, sail past at a distance) the Statue of Liberty for free. If you’re short on time or on a budget, it’s a valid option. And until around my sixth visit to New York, it’s the only way I’d seen Lady Liberty. 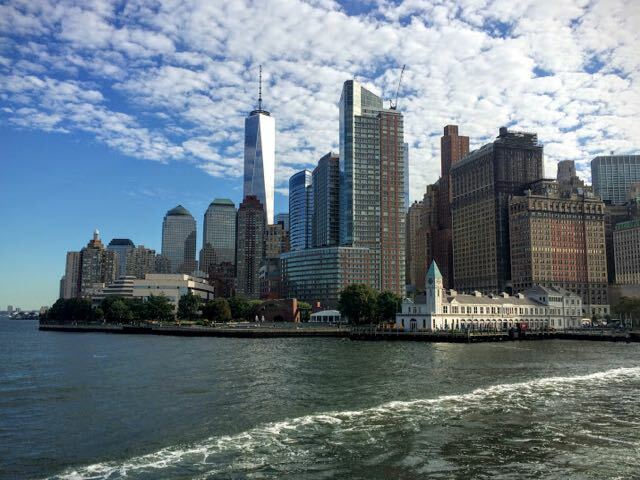 All you have to do is sit on the 25 minute (one-way) ferry to Staten Island. You can find full details for how to do that here. The two official sites for more information about how to visit the Statue of Liberty are the National Park Service website and Statue Cruises Website. Out of the two, the National Park Service site is much more informative, accurate and up to date. I hope that was useful but if you still have any questions (or extra information to share), drop me a line in the comments below…and have a great timing visiting the Statue of Liberty. Want to reward the author? I pay for 99% of my trips out of my own pocket. If you found this article helpful and want to make a small donation, it’s appreciated. Even $1 can help me find a new coffee shop or street food stall to recommend. All funds will be poured back into my travels which will be fed back into this blog. Thanks! Thank you for the information and the humour that made it an absolute joy to read! It was very informative and detailed and I love how you included every single aspect that a tourist might have concerns about and answered them in such a meticulous and comprehensive fashion. I was literally asking myself throughout the article “but how bout..” and then it was answered immediately in the next paragraph. Thank you so much! I’ve been all over the western U.S., Washington DC, Dallas, New Orleans, London, Paris, Normandy, Berlin, Frankfurt, Munich, and Salzburg, but I’ve never been to the largest, most famous city in my own country, and I don’t know if I ever will again, though I would REALLY like to visit the lady of green. 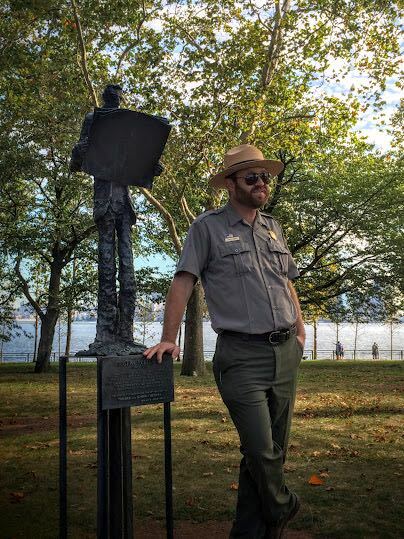 Before I read your page, I read the NPS’s page about the statue and I was thinking we might be able to manage it, but I’m now sure that would have been a catastrophic failure, and par for the course for yours truly! Therefore, though I wasn’t able to use your tips for a visit, I do think you saved me from making a costly mistake, and for that I truly thank you. If I am able to get back to NYC someday, I’m going to visit the big bronze beauty and I’m sure your info will come in handy. Hi Terry, it’s a shame you won’t be able to squeeze it in this trip but honestly sailing past on the Staten Island ferry was enough for my first trip – just being proximate. And this way, you’ll be able to see more of the city. Have a great time in Europe! I just have to say THANK YOU for this post. I’ve been reading and researching about visiting Statue of Liberty for literally an hour. Your review is the first reference I’ve seen to using the Statue Cruise website directly to book tickets. I was all ready to book on the ‘statue of liberty tickets’ website. You literally just saved my family of five $35. I am grateful!! Thanks! Yep, too many ticket touts out there! I hope at least some of that $35 goes on a hot dog ;p Have an amazing trip. Hi there, how do I book a Pedestal tour that begins at 8.00 or 9.00 am leaving from New York I am looking at these dates the 29th June, 30th June, 1st 2nd or 3rd of July this year. I have gone onto Statue Cruises website and it only gives me 11 am as the earliest time on the 2nd but then says I cannot book 3 ppl. The next time is 12.00 midday. I really do not want to get on the ferry at 12.00 midday as we also want to see Ellis Island. Is there any other site or booking company that I can get on an earlier ferry guaranteed before midday preferably by 9 or 10. I guess I’m trying to find out if the tour to the pedestal in the mornings on those dates is totally sold out? At the moment I can still book the tour thru Statue Cruises departing from New Jersey at 9.00 am but it will take me an hour to get there from where we are staying. So confusing please help, many thanks ? Hi Leigh, my guess is that the tickets are sold out on the date you’re looking at. I’d recommend trying Get Your Guide which sells Statue of Liberty tickets with pedestal access. https://www.getyourguide.com/s/?q=statue%20of%20liberty%20pedestal&customerSearch=1&searchSource=2/?partner_id=DDTNHTE I hope you manage to get the tickets you’re after. I am traveling to New York from the uk, doing Washington DC first (your guide is excellent), I am disabled and my parents are getting on in years they don’t know about this trip, my question is as they don’t know I can’t ask them if they want to got to the crown but I know my mum doesn’t like heights, however my brother & dad don’t mind. How long would it take them to go to the crown if we wait at the bottom for them? We are going to be in New York from the 31st December until the 5th January, is it likely to be very busy as it’s the holidays? Hi Bev, sorry for the slow reply. As there is a constant stream of people looking to visit the Crown, you’ll naturally moved along anyway. Also, because of the limited tickets, I doubt you’re talking about hours of queue time. That said, I visited on the first ferry and it wasn’t around the New Year. I’ve not travelled at this time of year but I suspect it will be incredibly busy – New York for New Year is on almost every bucket list I’ve seen. I don’t know about your budget but if you can afford to lose a few dollars, I’d recommend buying the Crown access tickets for those of your party who want to go up and see how it is on the day. In my opinion, the Crown wasn’t that impressive. Either way, there is a small place to grab a coffee and a sitdown so you won’t be waiting out in the cold if some of you do go up. I hope that helps and I hope you have an amazing trip! Thank you so much for all the info. I found it very helpful. My husband and two teenagers (14 &16) will be arriving in New York from Sydney, Aust on the 28th of December and will be there until the 2nd of January. We have already booked the 9/11 museum tour for the 29th. My question is… is it worth going through companies like Viatour or Get Your Guide to get a more compressive tour of the two islands or are the Rangers and audio tours just as good. Also which day 30/31 Dec or 1Jan do you think would be a better day. Hi Luise, I’m glad you found my article useful. I was very happy with the ranger tour and probably would have found a more detailed tour a bit too much. However, my suspicion is that a paid guide will just reiterate the same facts as the Ranger but for a fee. As much as I love wandering around museums, I don’t think I would have had the patience for a guided tour of Ellis Island. There is just so much of it that a tour could stretch on for half a day. That said, guides are usually pretty upbeat by nature so they might help, particularly with teenagers, to keep things interesting. It’s a tough call – I’d check the reviews (I had a quick look and this one is popular: https://www.getyourguide.com/new-york-l59/statue-of-liberty-and-ellis-island-4-hour-guided-tour-t53542/?partner_id=DDTNHTE). As for the dates, I’d check the public transport options. I know that in London, transport is more patchy on New Year’s Day than New Year’s Eve so you should check if the ferries are working. Otherwise, I imagine New Year’s Eve and New Year’s Day to be pretty quiet when other people are out planning or recovering from the New Year celebrations. I’d be interesting to know if this plays out so, if you have time to come back and let me know, I’d appreciate it. Have a great trip! hi , great information , well written. thank for making our new york trip better. Ahh, thanks and you are welcome. I’m pleased you had a good trip. Your info was thorough and extremely helpful. Thanks for taking the time to help others. You’re welcome – have a great trip and say hi to Lady Liberty for me. Thank you so much for all the info!! You’re welcome – enjoy New York! Hi Jo!! Great info, thanks for compiling! We will be there on October 25, I’ve read in a few places to expect to stand in very long lines to both get on a ferry as well as getting into the statue. My thought is to make sure we’re there for the first trip over, thus hopefully missing allot of standing and waiting. Three in our party, only two want to go to the crown and the other just to the pedestal. No interest in Ellis Island this trip…. Think that we can do this in 3-4 hours? We have a very short stay in NYC and trying to do several things before we have to leave, so trying to do a schedule ahead of time. Hi Rita, if you take the first ferry in October, I think you’ll absolutely be able to do it in 3-4 hours. Queues were low when I was there end of September so you should be fine. Have an amazing trip and say hi to Lady Liberty from me. Thank you for this post! Surprisingly, there’s not as much information about a day at the Statue and Ellis Island as I’d hope, so your post was most welcome! Question: With “reserve tickets for the pedestal” do we also get to go in the express lines at the ferry? I’ve noticed that tour groups advertise that there is a “reserve line boarding on the ferry” and I wonder if that’s also what we have if we have a time on our ticket? We’re going in April so crowd are a concern when we only have two days to run through NYC. Hi Angie, I know – I thought there’d be tonnes of sites with comprehensive details for visiting. Glad I wasn’t the only one who couldn’t find it. I’ve just checked and according the the Statue Cruises website: “The Reserve Ticket allows you priority entry into the Screening Facility Queue which saves you time at the departure point. Prior to entering the Statue of Liberty National Monument there is a second security screening.” So, yes. You do get to go in the express line. Hope that helps. I always carry an extra medium lens in a fanny pack for my DSLR camera. In your opinion, would I be able to wear that around my waist going up to the crown and not have to leave it behind in a locker. I look at it as that’s my bottle of water around my waist. Meaning, if you can carry a bottle of water up with you, I should be able to wear a small fanny pack up. Hi John, in my view, I think they’d make you take this off. The rule doesn’t seem to be about the size of what you’re taking but more that you can’t take anything other than absolute essentials (a camera and bottle of water). However, if I were you, I’d email them in advance and see if you can get permission then print the email if they say yes. Worth a try? Have a great trip! Hey! Great read. I just have ine question though, can we buy the tickets in cash when we get to the ferry I mean is there an option for people who would like to purchase tickets offline! Hi Kanza, sorry for the slow reply – just after New Year I flew to Asia and I’ve been off the grid. To answer your question, you can buy tickets offline in cash on the day at the Manhattan ferry point, which is in Battery Park. The thing to be aware of is that you won’t be able to get Crown Access on the day. You should also be prepared to queue because on-the-day visitors get lowest queuing priority. There is also a phone number you can call if you want to book that way (number above in the post). I hope you have an amazing visit.